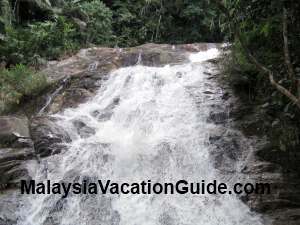 If you are going to Cameron Highlands, plan to use the Tapah way instead of Simpang Pulai way and you will be able to stop by and enjoy this huge waterfalls which is about 20km before the town of Ringlet. This waterfalls is easily accessible to the public as it is located just by the side of the road. You will not miss it as there are many stalls set-up by the road side that sell handicrafts work, drinks, snacks and other produce from this area. Park carefully by the side of the road. Signage welcoming you to the falls. As you are about to reach this place, you will notice that the traffic will slow down as many vehicles will be parked by the side of the road. Make sure that you find a suitable parking place and do not block the traffic. Be careful as you get off your car as the road can be quite busy especially during the weekends and public holidays. 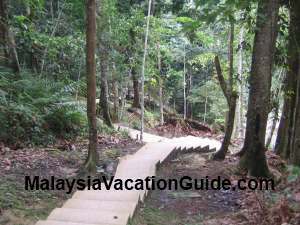 You will see that many of the visitors who stop by here are either on their way to Cameron Highlands or coming down from the highlands. If you would like to take a dip at the cool and refreshing water that originates from the mountains, make sure you bring along your tower and clothes for changing. There are pools of water that you can use at the base of the falls. Many children can be seen playing with the water. As the place can be slippery, make sure you walk carefully. There are cemented steps that have being built to help you go up the falls. Gazebos with benches have being erected and you can use them for picnic with your family or friends. 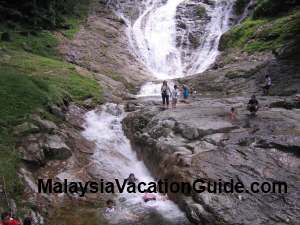 On a hot day, this place is refreshing as the moisture from the water provides cooling effect to the surrounding area. The waterfalls taken from the base. 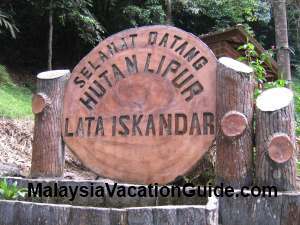 The concrete steps to help you go up Lata Iskandar falls. Take note of the trees and other plants here. The stalls by the road sell snacks and food such as corns, sausages and sweet potatoes. Soft drinks and mineral water can also be purchased here to quench your thirst after your walk to the top of the falls. 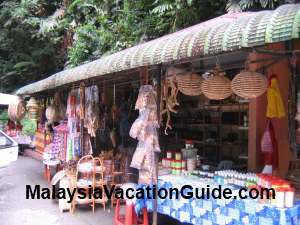 If you are thinking of getting a last minute souvenir, you may want to browse at some of the craft works done by the "Orang Asli" or the natives of this highlands. Operation Hours: This is an open area. The waterfalls taken at the end of the cemented steps. There are many souvenir shops setup by the shoulder of the road. 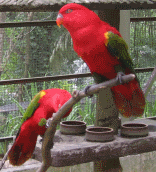 Head for the North-South Expressway and travel towards Tapah. Exit at Tapah toll and turn left at the first traffic light after paying your toll. If you would like to take your meal or purchase some snacks, you need to turn right towards Tapah town. 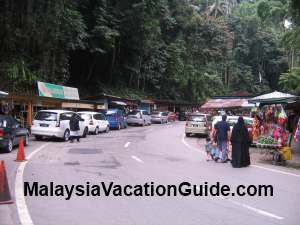 Travel along the road that goes to Cameron Highlands and you will not miss this place.